Cinch! is a new diet book by author Cynthia Sass, M.P.H, R.D. It is designed to help you “conquer cravings, drop pounds and lose inches.” What initially drew me to this book is that the author co-wrote one of my favorite nutrition/diet books “The Flat Belly Diet.” Once I started reading Cinch! I was drawn to the fact that this is not a “one diet fits all” book but rather it allows you to follow the program in the way that suits you best so that you have a better opportunity to succeed and meet your goals. For example, Cinch! starts with a very structured and effective 5 day “Fast Forward” menu which essentially tells you exactly what to eat and drink for the first five days to really kick start your efforts. There is even a helpful quiz that helps you determine if this would be a good fit for you or not. In my case, I decided not to do the 5 day “Fast Forward” because it is much easier for me not to follow a structured plan when I am cooking for a family of five, including three little ones. Instead, I utilized numerous components of the “Fast Forward” and went straight to the “Core” program. In my opinion, one of the most attractive parts of the Cinch! methodology is that it is written by a nutritionist and health educator and it includes healthy and whole foods such as yogurt, eggs, turkey, lentils, fruits and my personal favorite dark chocolate! It even includes a little SASS…..What is that? SASS stands for “slimming and satiating seasonings.” These are the five categories of SASS that you will use for the first 30 days (and beyond) and includes vinegar, citrus juice and zest, hot peppers (yum! ), tea (it gets better and better) and herbs and spices. I have always loved to season my food with vinegar, hot sauce and a variety of other seasonings so it is wonderful that it is actually encouraged as part of my eating program. I was very impressed with the Cinch! core program that includes delicious recipes such as Black Bean Tacos with Cilantro-Jalapeno Guacamole. This recipe was a big hit with my husband and little ones too as it tasted simply fantastic. In the morning, I am not typically a big eater so the Strawberry Cardamom Smoothie with Cashew Oatmeal was a great way to start the day and gave me lots of energy to keep up with my kids. My children were thrilled that Cinch! includes lots of healthy fruits including grapes and berries and they were able to enjoy healthy snacks along with me during the day. I also liked taking the “My Size” quiz to perfectly customize the core to my body which worked out really well for me. The Cinch! Core program really is an all inclusive healthy eating guide for anyone looking to find new inspiration for their diet or to lose weight and since I am seeking to do both it is a perfect fit for me. By following the Cinch! program you can possibly “lose up to 7 pounds in the first 5 days and 15 pounds in 30 days.” Now remember that I chose to skip the initial 5 day “Fast Forward” but I have still lost 8 pounds in the 19 days that I have followed the Cinch! eating plan. I am well on my way to losing those last 30 post pregnancy pounds which have stubbornly followed me for the last three years. I feel satiated, energetic and honestly better than I have in a long time. Are you ready to pre-order Cinch! and get started? 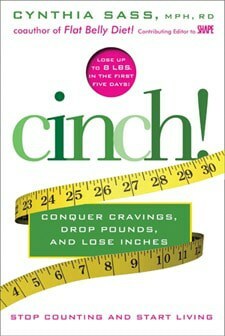 You can learn more by liking the Cinch! Facebook page or you can pre-order directly on Amazon or at Borders. Wow…I just noticed that the pre-order price is only $15.59 which is a real savings over the list price of $25.99. Pre-ordering is a great way to save money and get started on your weight loss goals too! What a good review. I love that you hit more than the highlights. You sold me on it!